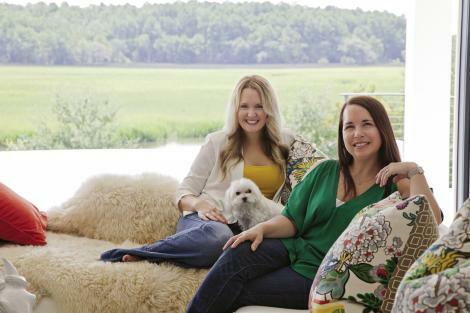 Conversation Peace: Interior designer Deidre Alexander (left) and homeowner Jennifer Feinman with her pooch, Chai. Room with a View: A mixed media work by Ben Hollingsworth hangs over the linear fireplace in the living room. The armchairs are Midcentury Danish pieces by IB Kofod Larsen with a 1960s Hollywood Regency brass cocktail table. The Louis XVII-inspired chairs are upholstered in white vinyl. Molly B. 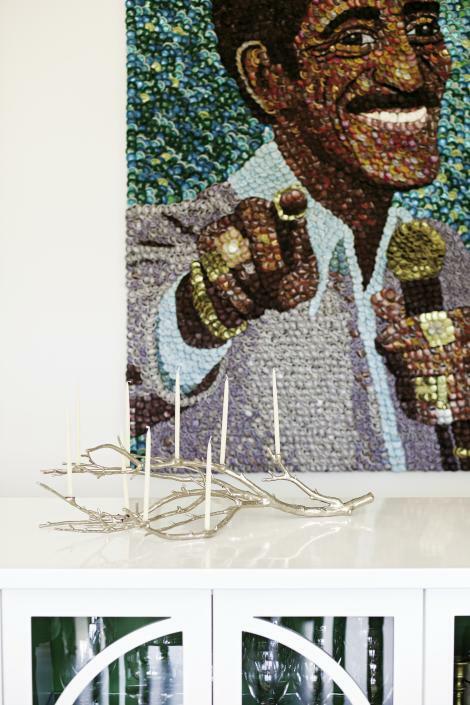 Right collage of Sammy Davis, Jr., and a Sputnik starburst chandelier headline the dining room, where Deidre designed the table to seat 12. Modern Family: The kitchen features wenge cabinetry, high-gloss Caesarstone countertops, and Saarinen-inspired tulip armchairs. 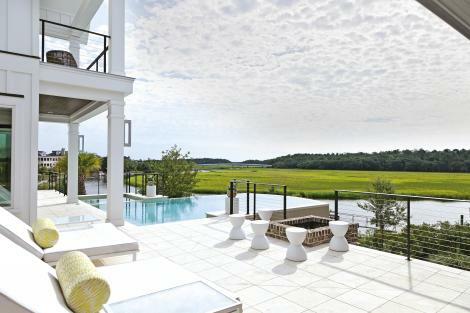 Marsh Living: The broad second-floor terrace faces Daniel Island’s Ralston Creek. The pair of double loungers are upholstered in Sunbrella fabric. Open-door Policy: Accordian-style doors fold open along the rear of the house, where the living room steps out to the pool. 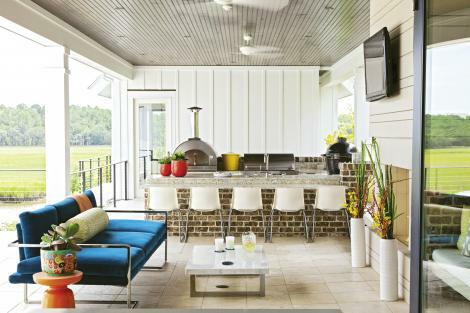 Seat Yourself: Ikea chairs line the bar in the outdoor kitchen. The marble coffee table and low-slung sofa were custom-designed by Deidre; the upholstery is a sturdy SilverState outdoor velvet. The fabric for the throw pillows on the built-in seating is by Trina Turk for Schumacher. 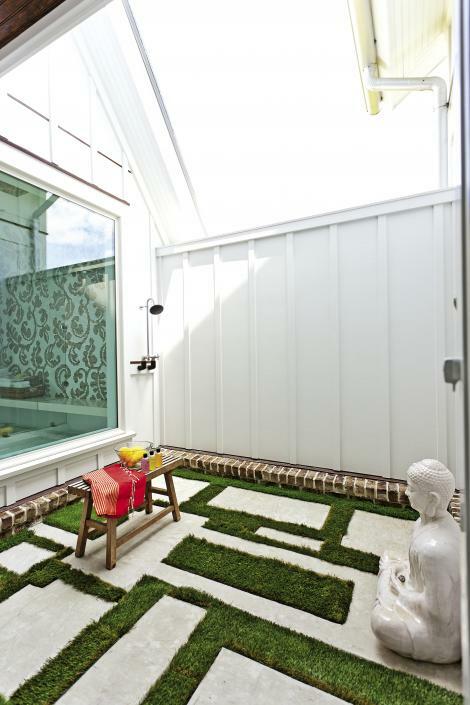 Concrete pavers are set in a geometric pattern in the outdoor shower adjacent to the master bath. The Buddha statue is by Cyan Design. And indeed they do. 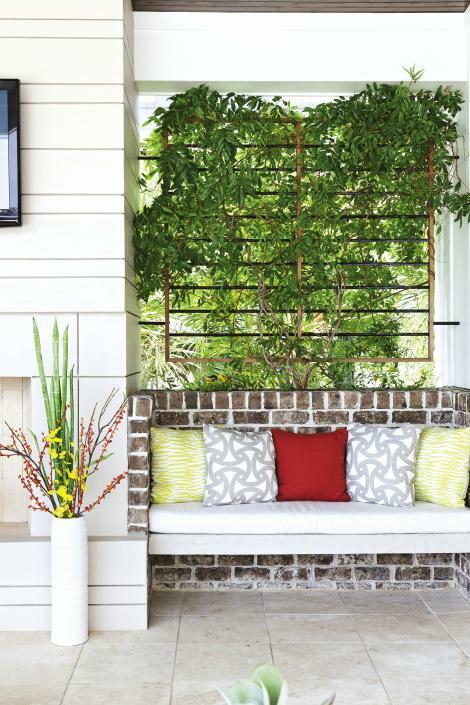 Jennifer and her husband, Mitchell, known whimsically as “the rock doc”—a rheumatologist who’s treated a long list of platinum selling artists—stretched three sets of these disappearing walls across their home’s broad second story to create a real and practical connectivity to their outdoor spaces. But more importantly, these doors were part of the family’s big-picture plan to ensure connectivity to each other. After laying out the floor plan with architect Michael Spivey of Spivey Architects, the Feinmans linked up with interior designer Deidre Alexander, whose adeptness in architectural design and creative space-planning hooked the homeowners. And she could also translate Jennifer’s stack of decorating ideas—mostly torn from magazines—into workable plans. “It’s one thing to have a clear concept of the house you really want, and it’s another to bring it down to earth, to budget, to realistic choices,” adds Jennifer. For Deidre, that meant juxtaposing the vast white walls and sleek modern trappings with warmer, Midcentury furniture; translating pie-in-the-sky ideas down to scale and budget (for instance, the original Sputnik chandelier the Feinmans wish-listed for the dining room was “much like the one we have now, but on steroids,” says Jennifer; Deidre found the scaled-down starburst version); and adding color to the outdoor rooms by way of Vitrastone countertops—a vibrant mix of shells and seaglass—and an electric teal sofa. Despite the emphasis on tried-and-true practicality, Jennifer was keen on incorporating Zen-like elements to instill a sense of peace—for instance, the infinity pool that edges out over the quiet marsh and a grassy outdoor shower adjacent to the master bath where a serene Buddha statue stands guard.